A cricket match on Easter Sunday leaves your match reporter with few easy angles to exploit for cheap laughs. If only there was a topically seasonal way of describing a batsman who a bowler has a habit of getting out. How I wish there was some kind of relevant bit in the bible to parse when describing a batsman who is invited a back for a second chance having been cruelly treated in his first life by a man who he thought was a friend. Or at tea, when 12 men were sat around a groaning table listening intently to their leader and considering the hours ahead, what if there was an image could I conjure in the reader's mind? In the absence of such, you shall have to make do with a literally prosaic description of the events of April 21st 2019, but what events they were and always are when the Mandarins meet the Superstars. Even two testaments would never be enough to do them justice. We were gathered there that day to celebrate the life of a bearded Jewish man, around 40 years old, who, it might be said, was definitely not the messiah but a very naughty bowler. While not the son of God, he had placed a son on each side of the game and used his powers not to turn water into wine (although plenty of that was to be taken later) but the miracle of stitching up a toss a week in advance so that he could bowl first on a tacky April pitch and then spend more time drinking and drinking in the unseasonably glorious sunshine that glistened like the golden foil on... no, nothing. Oh if there was just some kind of popular confectionery product at this time of year. Superstars openers Spencer-Bickle (24) and Gaught (15) started well with an opening partnership of 40, surviving the testing seam and swing of Eastaway, Heard and Forman (H) and offering a few heavy blows down the ground (although Spencer-Bickle was fortunate that the bearded Jewish man was blinded by the light when offering a simple skier). But the openers also seemed to doubt their leader's instruction to hurry up, for they did not believe that their captain had seen this slow tricky wicket for himself. Their doubt caused confusion, to attack Chris(tian) Healey or not? Healey himself (5-1-16-2) was full, of length and belief. Both openers were out, of the innings, and of faith in their skipper forevermore. Their captain caused further confusion and damage with his trademark running (people out) between the wickets. One such innocent was Superstars debutant Holroyd, not even afforded a chance to state his case when run out by Gigg without facing. Meanwhile the spinners were on the march, with the bearded Jewish man (6-0-14-3) and his guide and mentor McIntyre (5-0-2-16) running amok among the middle order. The Mandarins' leader then dispensed gifts to all of his acolytes, using 10 bowlers in total. The 11th Superstars wicket (Holroyd in his second life, this time running himself out) really was the final nail on the? on the?... no, still nothing comes to mind. Anyway, it was time for an excellent tea thanks to our obliging hosts at Streatham and Marlborough CC, including small chocolate ovals for those lucky enough to have found them and some mildly spiced buns with a chequered white pattern laid across the top. No idea why they only appeared for this fixture, but tasty nonetheless. Comeback from the dead analogies are, well, perhaps a bit bad taste and, frankly, a Superstars comeback was never close to the cards, let alone on them once the Mandarins innings was given a firm footing with a steady third wicket partnership of 58 between Eastaway (24) and Wilmot (33*) after the threatening Forman (S) (9-3-19-1) had been seen off. Venky, despite at least 40 days and 40 sleepless nights with his newborn twins, then showed us the true way of batting life on this pitch, with a breezy 10* that made everyone else's more painful efforts look like mere mortals and took the Mandarins past the target with several overs and wickets to spare. But though the Superstars were not the resurrection, some were the life of the after party at least. And though they died on the pitch, they lived in clubhouse, where curry was consumed courtesy of the bearded Jewish man and his Muslim friends at the Mirash Tandoori, for this was a day of peace among all men, despite a few controversial LBW (umpire Baxter) and run out (umpire Hemingway) calls. And though the two teams eventually parted, for all good things must pass, they will meet again in Heaven, or at least at Abbey Rec in South Wimbledon (and where else is Heaven really?) for a twenty20 in July. Perhaps some helpful analogies will have come to mind by then. For anyone wanting to make a donation in Mike's memory, the family are suggesting either Myeloma UK or Maggie's Centre. His wife, Fiona, has said that both organisations helped her and Mike a lot over the last 5 years. As 2019 dawns you might like to know how the archive is placed. I am very grateful to all who have rummaged in their attics or laptops. Thanks to Robin for some very early documents. And Peter Lewy and Mike Richardson for the scorebooks of 1979 to 1993, although a couple of those years are still missing. Rob and Chris have filled in much detail for 1998 to 2001. Chris, Olly and Andy have combined fantastically to provide and disentangle the notorious SQL-dump, which gives extensive team and individual performances from 2005 to 2015 plus what I expect are all extant match reports from that decade -135 pages of them. The later scorebooks that I currently have will also give us a partial or complete insight into the years from 2002 to the present, although there are some big gaps. Those of you still planning to rummage at the back corner of the cupboard, now's the time! I have yet to analyse exactly what is missing from these years, and correlate with the SQL stats and match reports. The biggest complete black holes remaining are years from 1967 to 1974, where I have absolutely no evidence whatever' and 1995 to 1997, likewise. As always, all help gratefully received. Whilst I am still in the collection phase, it would be good to have any suggestions for what analysis or publications the Mandarins would in due course like to see from all this stuff. Jon Porter writes to say with the sad news that Michael died on 10th December. As some of you were aware, he had been battling myeloma for a number of years but in the last couple had been well enough to come along to spectate at a few of our games. Those of us who were fortunate enough to play with Mike will remember a stylish batsman, an accomplished keeper and someone who smothered their face in zinc cream like an Australian cricketer before it was fashionable to do so! The funeral will be in Oxford in Saturday 5th Jan - Jon has the details if anyone would like to find out more. Nick Davidson: I knew Michael as a Department of Trade and Industry economist before he became a Mandarin cricketer. He was equally calm and congenial in both contexts. I remember well engaging conversations with him both in the DTI canteen and the odd long cricket-related car journey. He is a very sad loss. Rob Eastaway: Michael was very good company, always thoughtful and curious and with a good sense of humour. He was a good cricketer and I remember being particularly grateful once when he saw off some hostile bowling at Roehampton and saved us lower order batsmen from having to bat. Michael was a lovely guy and I will cherish memories of many convivial chats over a pint. 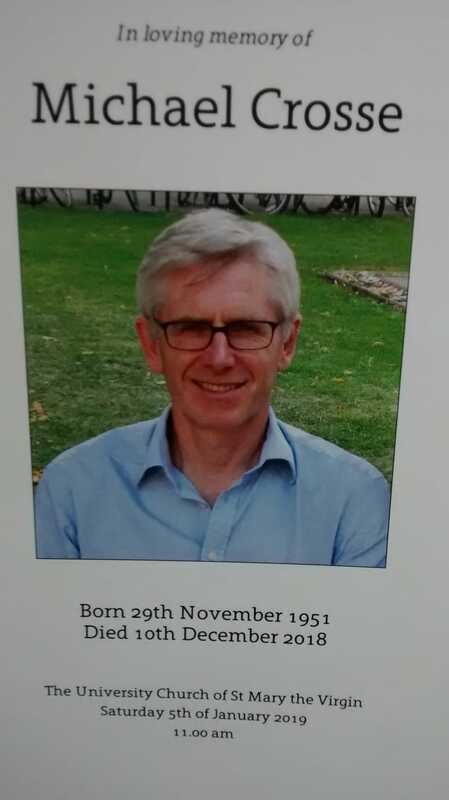 Tony Hawkhead: A really sad loss. A proper Mandarin spirit. Tim Baxter: Very sad. Mike was a gentleman and a good cricketer. It was a great pleasure to meet up with him again at the curry a year or so ago. Chris Baker: Gentleman is a very apt description. I can't recall him ever other than calm and elegant. Very sad. Andy Heard: I remember Mike as a keen volunteer for any game within striking distance of Oxford, and as Jon says, he was a pretty decent wicketkeeper throughout that time. He also toured Suffolk with us in 2005. We'd lost touch with him in recent years, so it was a particular pleasure that he was able to make it to the end-of-season curry in 2017. As far as I can tell, Mike's playing career for Mandarins ended with two matches in 2006; the report he wrote below therefore seems to also have been his final game for us. The result of this game can be encapsulated by saying that a young pacey Mandarins attack finished off Reading after their run chase faltered. On a still grey afternoon with just a hint of autumn in the air Reading invited us to bat. Healey and Mckeon saw off the brisk opening bowlers and took the score to over 50. Healey went on to make a personal fifty with some of his characteristic pulls of anything short. One bowler then had to leave the field with a ricked back, having stopped a fierce return drive from Healey with his foot. Interestingly, Reading had a substitute who, he informed us, had told his wife he was shopping at B&Q, come by to see the game and just happened to have his kit in his car. Chris had to retire himself a short time later, with a pulled leg muscle. 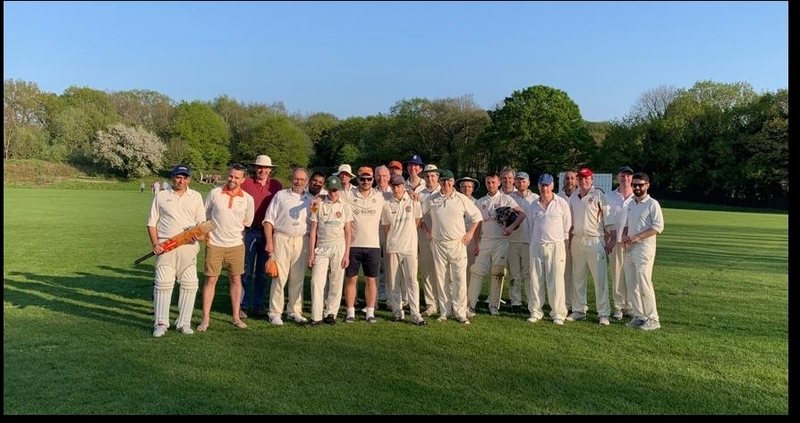 Crosse and Tunbridge pushed the score on but it was an aggressive partnership between Jean-Christophe Gray and Chris Evans, both scoring over 20, which took the final score up to the sporting total of 174. J-C rode his luck, being dropped four times, all off the same delivery. Over a tea of cucumber sandwiches and excellent jam tarts, we pondered whether we could stem the rapid scoring that Reading had achieved last year. Chris Healey chose an opening attack which blended youth (Matthew Evans) and guile (Andy Heard). Evans bowled with zip, consistently on and outside the off stick while Heard kept the batsmen guessing. The Reading openers took a few chances, survived and started scoring at more than the required rate. Chris then brought on his brother Nick in a change which brought an immediate wicket. Nick will admit it was not his best delivery but the ball turned on its second bounce and the bemused batsman scooped it into the hands of Porter in the covers. The number three scored rapidly but Chris Healey came on to bowl and tempted him into a cut too far and too late and bowled him. With 20 overs left Reading needed about five an over. Their remaining opening bat was going for it until Porter bowled him through the gate. After a few more wickets fell a draw looked the most likely result. Would Reading play out the remaining overs with the only entertainment being the Porter children using the boundary circuit as a velodrome ? No, for Healey had an ace up his sleeve. He brought on Gray and paired him with Matthew Evans returning for a second spell. Both bowled straight and on a good length. A strong hitting batsman swished at an Evans delivery, Crosse caught it behind and the batsman solved the umpire’s uncertainty by walking. Gray took a good caught and bowled and the remaining wickets fell quickly with several overs to spare. Gray finished with 4 wickets for 14 - a satisfying conclusion to an enjoyable game. The mission of the Wayback Machine is to compile an archive of the Internet, specifically to take snapshots of websites from time to time and store it indefinitely; or until the money runs out, at least. Fortunately, the old Mandarins site was snapped several times over the years and you can take a look at some old match reports, news items and so forth. For: 254/5 vs North Enfield. For: 85 vs Old Alleynians. Mandarins scored 2 centuries and 5 Fifties. Highest score Tim Baxter 110 vs North Enfield. Mandarins took only 2 five-fors. Best Bowling Rob Eastaway 7 – 3 – 10 -5 vs Mickleham. 47 players turned out, 17 of them just once. George Warren took 3 stumpings vs Aylesford, possibly equalling the club record (tbc). Worst collapse 6-11 vs Old Alleynians. M Simpson, 0; Quarell, 2; C Bassi,13; Guy, 0; H Bassi, 6; S Bassi, 4; Hawkhead, 7; Eland, 24*; Dugmore, DNB; A McKeon, 0; Jono Maher, 4; Meyler, 13; Badat, 0; D CHave, 27; A Eastaway, 1*; Thompson, DNB; Riaz, 19. Also Bowled Once: Simpson 5-0-23-0; H Bassi 5-0-24-2; C Bassi 4-0-9-1; Guy 3-0-8-0; Eland 11-3-48-3; Dugmore 6-0-17-2; Warren 3-0-37-2; Tunbridge 2-0-10-0; J Maher 4-0-18-1; Parvin 3-0-30-1; Mills 3-0-20-2; Badat 6-1-30-1; F Chave 11-1-34-2; Thompson 3-0-17-2; A Eastaway 1-0-10-0; Riaz 6-0-50-0. Feilding: Mandarins took at least 33 catches and 5 stumpings: Anonymous 9; Baxter 5; Warren 4 (3 stumpings); McIntyre, Baker, Wilmot (stumpings), Heard, Healey 2; Simpson, Eland, Tivey, J Maher, H Forman, Badat, S Forman, Manian, D Forman 1.